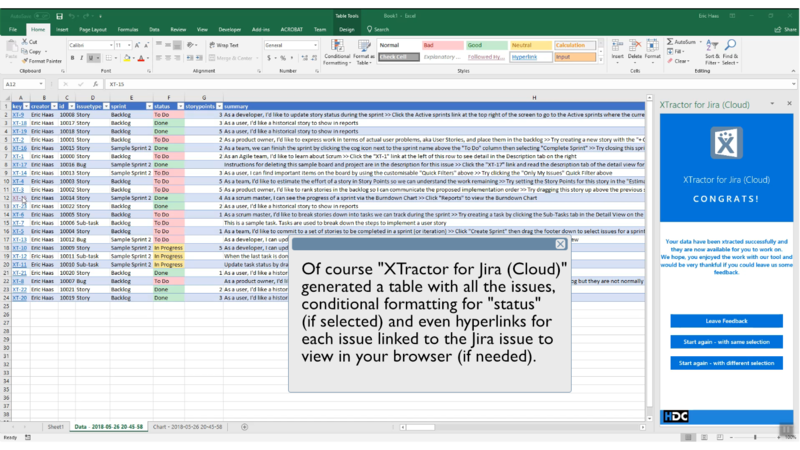 HDC - Project "XTractor for Jira (Cloud)"
The current version of "XTractor for Jira (Cloud)"
These features are planned to be integrated in future versions. 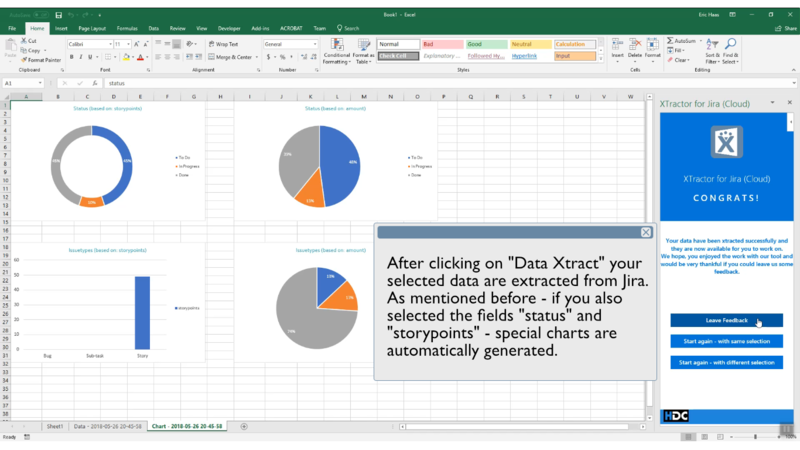 HDC developed an add-in for Office 365 (Excel) to ensure a smooth, fast and easy handling for creating complex reports based on existing Jira (Cloud) issues. One of the main aspects was to reduce the amount of workload needed to be done for getting reports about existing issues in Jira. 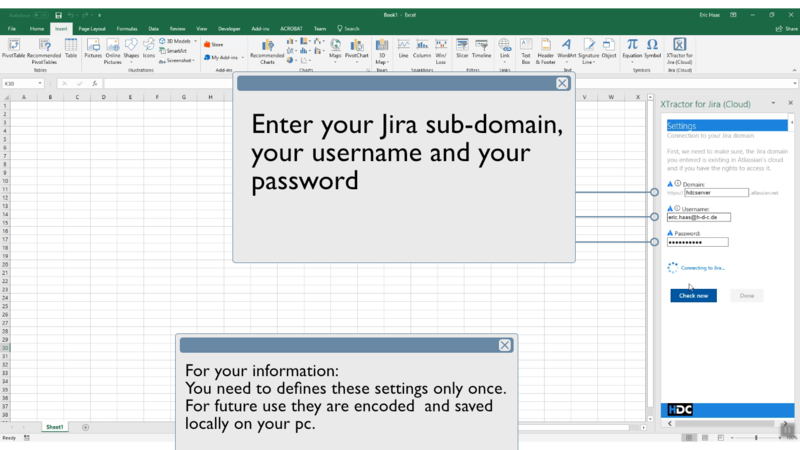 Understanding the Jira environment, changing and generating filters in Jira (via the browser), downloading issue lists and finally importing these lists into Microsoft Excel are now history. 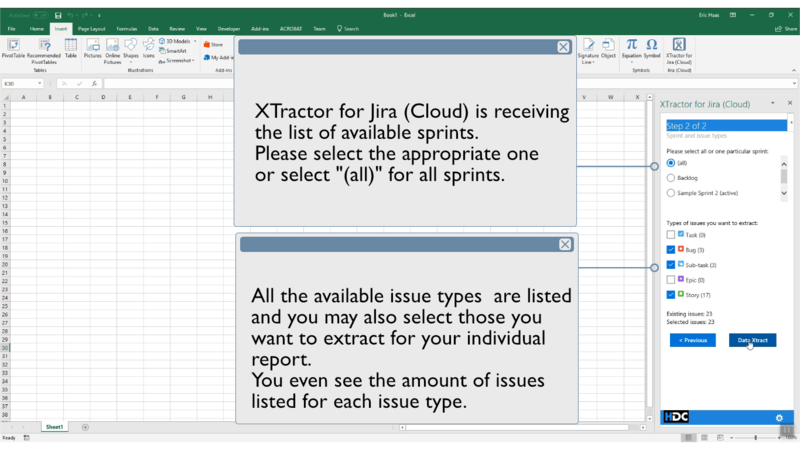 With XTractor for Jira (Cloud) you only need one application - Microsoft Excel. No more and you'll be able to generate perfect daily reports and data analysis. 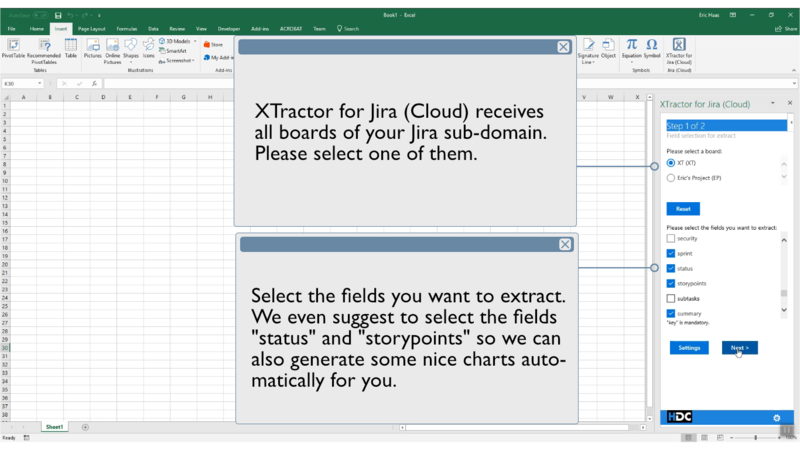 How to install "XTractor for Jira (Cloud)"
See our short (6 simple steps) and easy to use explanation of how to install "XTractor for Jira (Cloud)". First, load our add-in you can find at the official Microsoft AppSource. Select the board (project), the fields you want to xtract, a sprint (if needed) and the type of issues you want to be listed in your report. Click here to visit Atlassian's website. Select one of the given cloud products you can test free for 7 days. Enter your credentials and follow the steps to create your Jira environment. We recommend to select "See a project in action" when selecting the options for your Jira environment. To do so, simply click on "Create sample project". Questions, wishes, suggestions, help needed?